When sitting is a huge part of your job day in and day out; it becomes imperative to develop healthy habits to combat the aches and pains associated with a sedentary lifestyle. Some of these habits may include 5-minute walks around the office, stretching breaks or even yoga during your lunch hour. Whatever exercise you choose, be sure to make it a daily habit to ensure a healthy body, mind and spirit. There are also tools available to aid in eliminating annoying neck, back and shoulder muscle stiffness. This post is to introduce you to the best Moustache neck, shoulder and back massager. The location, the intensity and frequency of aches and pains are going to vary from person to person. This means a massager should have the adaptability to massage different body locations, change the strength of the massage and how often it massages. What are the standard features to look for? Portability, safety (automatic shut off to prevent over-heating), ease of use, and ability to reduce pain. The right massager may offer similar results to going to a massage therapist. Who has not had knots in the shoulder blade area (medically known as the trapezius muscles) after sitting still for long periods? What better way to relieve that tension than to have a shoulder massager to knead out those achy spots? A company conducted a focus group study on the different massagers on the market, and its findings were enlightening. Regular use of a neck massager, daily or even weekly, was important in experiencing the health benefits associated with the use of a massager. Upper and lower back pain are frequent complaints from office workers. This kind of pain is often from muscles spasms. If you put your hand on them, you can feel knots or sometimes heat. A back massager can help give your muscles much-needed relief. We have two Moustache® massagers available. 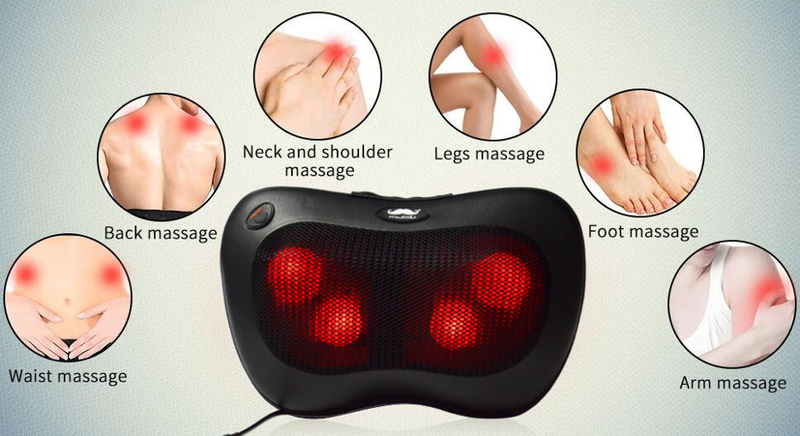 This pain reliever massager is programmed with 15-minute auto shut-off function to avoid overuse when falling asleep. The ergonomic U-design fits properly to your neck and shoulder areas, delivering the same relief to all your tired and tense muscles as a masseur does. Other ways to provide relief to your tired body muscles is to make sure you stay hydrated throughout the day, apply heat and cold, get enough rest and regular exercise. A neck, back and shoulder massager is an added benefit when you have been practicing the other healthy habits.